If you’ve been into AR15s for long, you’ve probably heard the name CMC Triggers before. If you haven’t, well I’m glad you’re finally hearing about them here. CMC Triggers is an American owned and operated company out of Texas, who specializes in high-quality drop-in trigger systems for the AR platform. They offer true drop-in fire control groups, with all of the main components (trigger, disconnector, hammer, and springs) all contained in an easy to install system, that any novice or beginner can install. They offer various models, including both single and 2-stage triggers, with multiple pull weight options. You can even choose to have a curved or straight trigger bow. We chose to test one of their 2-stage offerings, as it best suited our needs for a hunting rifle. As I’ve mentioned in other articles, I like a nice light, crisp trigger for hunting. So, we decided on CMC’s 2/2 2-stage, which offers a 2 pound first stage, and 2 pound second (hence the 2/2 label). During our unboxing video (click here to watch), I noticed right away why these triggers appeal to those looking for an easy to install, yet high-quality trigger. I also noticed that CMC Triggers is using a very unique design for their hammer and disconnector (more on that below). The CMC’s unique hammer, side profile. 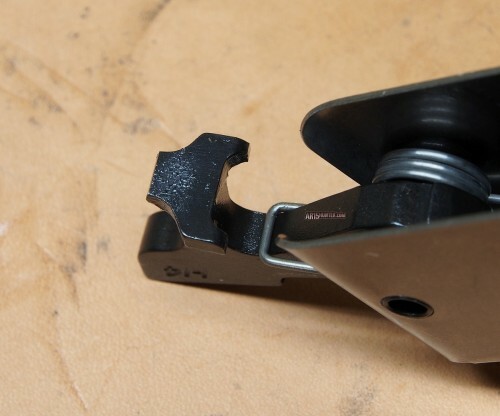 Here we have a close-up look at the very unique hammer design that CMC uses on their triggers. It has a claw like look to it, and there are two bearing surfaces on the left and right (you can see them better in the photo below). Another view of the CMC’s hammer. Unlike most hammers, CMC’s engages the disconnector in two areas, on the left and right. They note that their engagement surfaces are finish ground, which offer an almost mirror like surface finish (1-2 rms, where as a mirror is 0 rms). While this unique hammer/disco design seems to work well, I did notice that you have less surface area on the bearing surfaces of the hammer and disconnector, when compared to other trigger systems. Is this good or bad? Well, that’s going to be subjective. It could be the reason for the only “negative” I found with this trigger, which I cover more below. A look at the disconnector and springs. housed inside the trigger’s enclosure. Here is a closer look at the disconnector, which also features a claw-like look. Also seen here is the “Rocket Wire” hammer spring, which helps ensure you have plenty of hammer inertia to set off hard mil-spec primers. 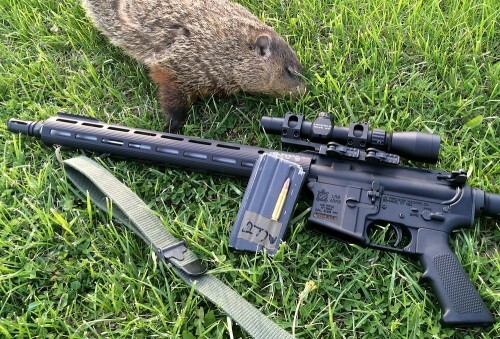 While we haven’t tested this yet, we’re hoping this means it will also work well with some rimfire cartridges that require a good solid strike, like the .17WSM found in Franklin Armoy’s F17 series of rifles. A look at the included retention pin kit. 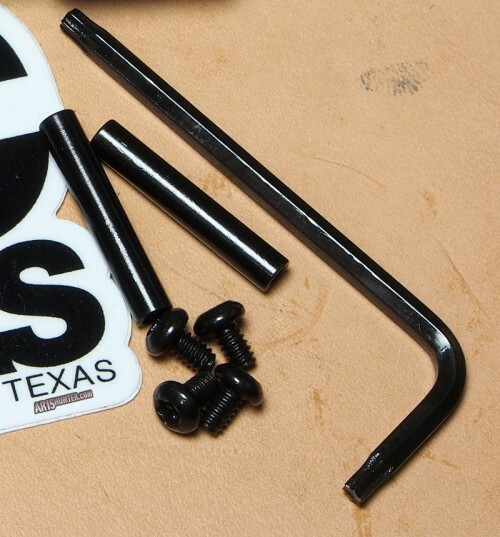 CMC includes their own retention pin kit. Their triggers are not made to be used with standard trigger pins. You get two pins with four small screws, along with two Torx wrenches. 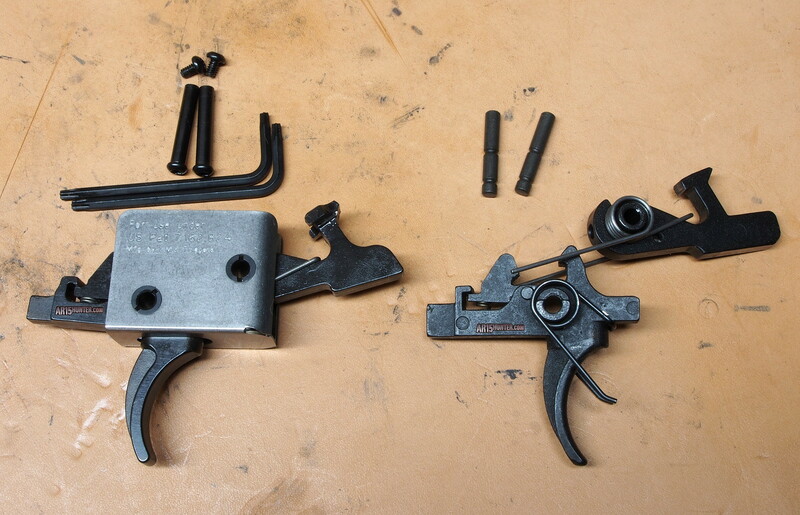 The CMC 2/2 2-stage compared to a Rock River Arms 2-stage NM trigger. CMC uses a totally self-contained design, meaning no struggling with tough hammer springs when installing their fire control group. Here we have the CMC trigger next to another popular 2-stage trigger system from Rock River Arms. Installation of the CMC trigger system is a piece of cake. This is a true drop-in system. You simply remove the grip and selector components (spring, detent, selector), and then drop the entire CMC unit into the lower. You then use the supplied pin kit, which consists of two floating pins and four set screws. They even supply the Torx wrenches needed for the install. 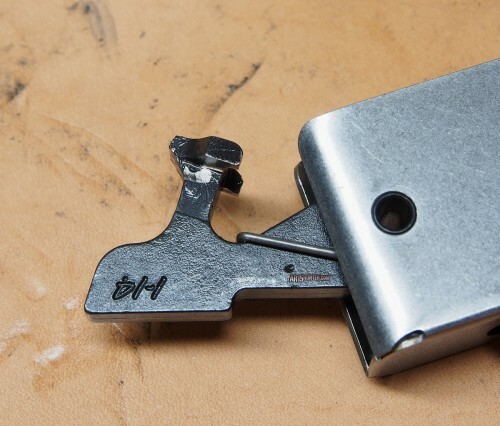 The pins slide easily into the trigger holes, and then you just tighten down the screws on each side. Once done, you may notice a bit of side to side movement on the pins. This is normal, and it may or may not be noticeable; it all depends on the lower you’re using. In my LRB Arms lower, I had just a slight amount of movement. This doesn’t affect function. 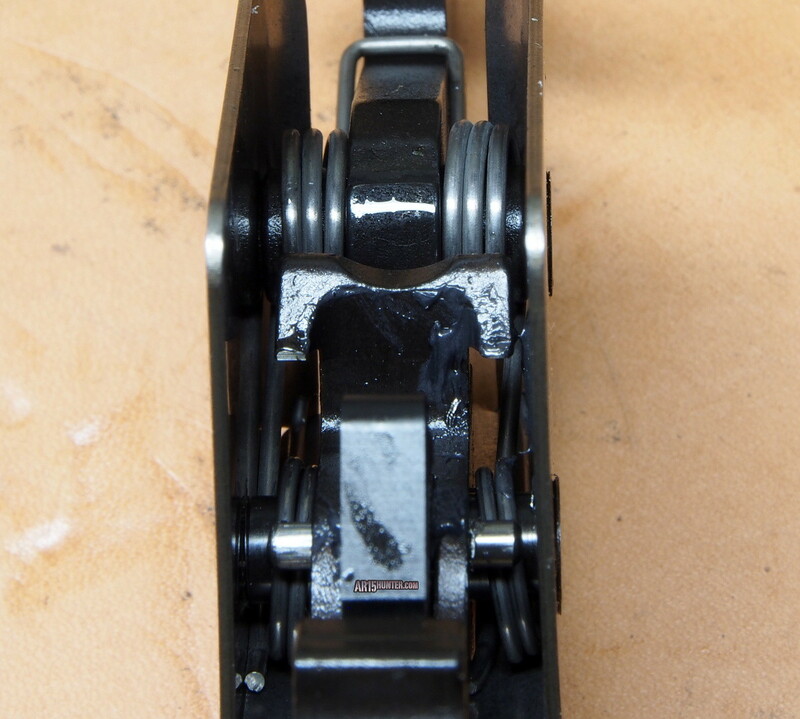 CMC had already applied a good amount of grease to the bearing surfaces, so that was one less step in the installation process. I’d say it took less than five minutes to install this trigger system, and half of that was probably spent trying to get the grip screw back in its hole (Allen head grip screws are so much better than flat head ones). Once the trigger was installed, I went about my usual routine of doing several function checks. I then started with some dry fire drills. Initial feel was that this trigger offers a very pleasing pull through the first stage, and a nice break of the second. However. Initially, I noticed that it was very easy to pull through the second stage. The wall you hit is not near as defined as many of the other two-stage triggers I’ve felt/tested. The reset was nice and positive, with the trigger guiding my finger to the reset nicely (thanks to a good strong trigger spring). I also noticed that the reset was shorter than many of my other 2-stage triggers, which I like. Trigger bow comparison. Left to right; CMC Triggers 2/2, LaRue Tactical MBT-2S, Geissele Hi-speed DMR, Rock River 2-stage Varmint. Another thing I noticed as soon as I put my finger on the trigger was that its bow was much wider than a typical “GI” style bow. If you read my LaRue MBT-2S review, you’ll remember that I actually prefer a wider trigger bow. Due to having large hands and long fingers, the wider footprint offered by CMC is much more comfortable to me. Also, the bow of this CMC trigger has a flatter feel to it. If you look at the comparison photo above, you can see that the CMC trigger uses a longer radius on their bow, meaning it’s a bit flatter than a traditional AR15 trigger bow. Next I pulled out my trusty Lyman Electronic trigger pull gauge and did some pull testing. While CMC notes this trigger has a 2 pound set / 2 pound release (for a total pull weight of 4 pounds), my CMC was breaking closer to 3 3/4 pounds. This is right in my preferred pull range, which sits between 3.5-4 pounds. For me, this range gives me a trigger that’s light enough for precision shooting (something that’s required when shooting at small varmints, or long range shots on larger game), while still offering a “safe” pull weight. If it was much lighter, I’d be afraid that the trigger would go off before I wanted it to. Now it was time for the real test; live fire use. Being that we have several uppers in for testing right now, it was the perfect opportunity to really see what this CMC trigger felt like, and see how it helped with my groups. Now, it’s important to note that a good trigger does not make your rifle more accurate. However, it does lend to accuracy, as it can allow a shooter to be more consistent. Consistency is key when trying to shoot precisely; whether you’re shooting groups for your hunting zero or shooting at game. Like I mentioned earlier, I noticed it was very easy to accidentally pull through the second stage. At first, this was about the only negative thing I could say about the CMC. After a fair amount of time with the trigger during live fire, what I found was this lighter second stage feel actually forced me to practice more trigger control. And, when looking at the groups I was producing with the two uppers I tested this trigger with (.277 Wolverine and .25-45 Sharps), I was very happy with how it and I were performing. It was not uncommon for me to send 5 or more rounds into one hole at 50 yards when getting my zero. Unlike some of my past trigger reviews, I actually got some field time with this trigger before completing my review. Being that our weather is finally starting to warm up here in northern Ohio, I was able to take the CMC trigger out into the field for some varmint hunting. While patrolling a couple of local farms, looking for groundhogs, I happened upon a nice fat female whistle pig digging out her huge hole. I got setup and took at shot, which just grazed the pig (leaving a large tuft of hair behind). As she took off running, I was able to quickly fire a second shot that stopped her dead in her tracks. She was running full bore, and I was very impressed at how well the trigger performed for this task of shooting a quick follow-up shot. This is thanks in part to the trigger’s short reset and minimal lock-time. A shot from out in the field with the CMC Trigger and our .277 Wolverine upper. CMC Trigger’s 2/2 2-stage trigger performed very well while in our care. It offers a smooth first stage, the second stage break is clean and crisp, and the rest is short and positive. The fact that this is a true drop-in unit will ensure that novice builders and hunters won’t have any issues installing this into their favorite hunting rig, and there are no complicated adjustments that need to be made. When I first started testing this trigger, I was concerned with the second stage. While it offers a clean and crisp break, I felt like there wasn’t a defined “wall” that you hit when slowly pulling through the first stage. It’s there, but it’s very easy to pull right through it. Up to that point, I had not actually used the trigger for live fire. I was afraid that while out hunting the trigger might send the hammer forward before I wanted it to. You see, once I have my target in view, I slowly pull through the first stage, or take up the “slack” in the trigger, so that it only requires a small amount of additional pressure to drop the hammer. I was worried that I’d pull right through the second stage during this process; and miss the shot. What I found was that this never happened. Instead, it forced me to practice even more trigger control. So, what I originally thought was the only negative I had found with this trigger, ended up being sort of a positive. With a street price of about $230, the CMC is priced right in line with its competition. This is a well made trigger system that is very simple to install, and will help improve a hunter’s confidence when out in the field. 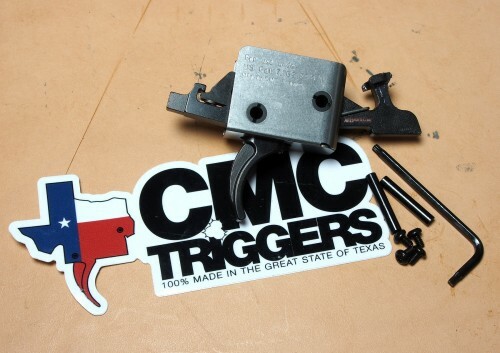 And, for those who prefer single stage triggers, CMC makes those as well in various pull weights. Visit their website to learn more.